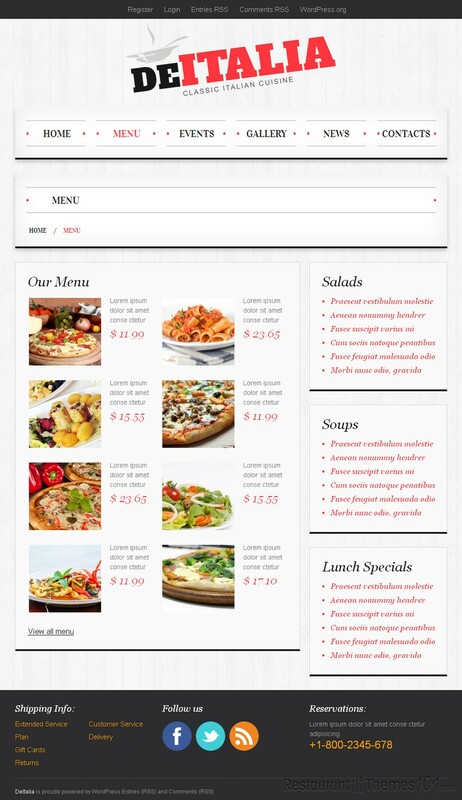 De Italia is an Italian restaurant theme for WordPress featured at Template Monster. This responsive restaurant WordPress theme was created by Mercury. It has a nice amount of useful features and a very likeable layout. The design of the layout is very light with a nice set of appetizing colors: white, red and orange, and a pretty, white textured background. The homepage features a huge slider with big, quality photos of delicious food you can present to your visitors and make their mouth water the second they enter your website. You can place your most important news and posts right under the slider and drag your visitor’s attention to right where you want it. You can also add testimonials from your satisfied customers and let your readers read some firsthand information about your place and delicacies. Creating events is also possible with this theme, and it is also easy. You can announce upcoming events along with photos and descriptions and keep your visitors updated at all times. This theme has nice social integration so you can connect your website with Facebook, Twitter and RSS feed. De Italia has Google Maps integration in the contacts page, and your visitors can easily see the exact location of your restaurant. De Italia presents a nice menu, which is very easy to create and categorize so your visitors can easily see what you have to offer, along with photos and descriptions of your meals. The theme was created using Cherry Framework which gives it many tech advantages. The admin panel is very powerful and easy to use, and let’s not forget to mention Bootstrap, the nice an sleek front-end framework used for this theme, guaranteeing easier and faster web development. 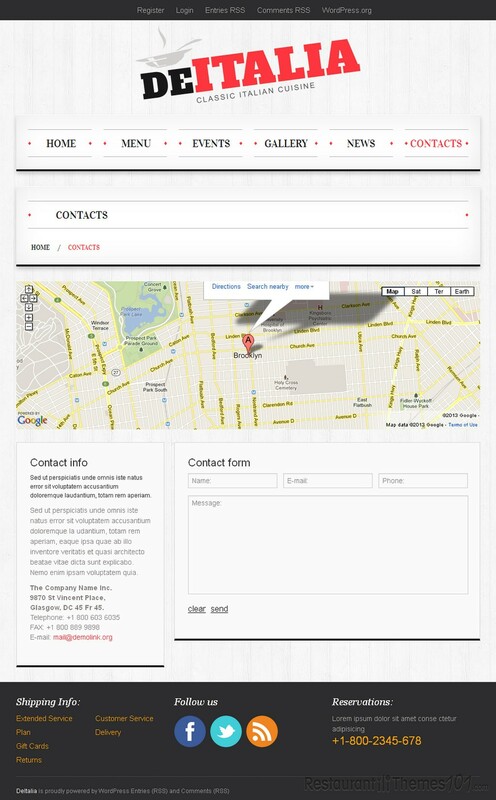 This is a completely responsive theme, with a layout that will automatically adjust to any given screen size or resolution.